Trying to identify a 1960s Japanese guitar can at times be very hard work considering the number of often obscure brand names used, and the fact that different manufacturers seemed to share hardware and even guitar designs. You can see why many people just say "Oh, that's a Teisco." 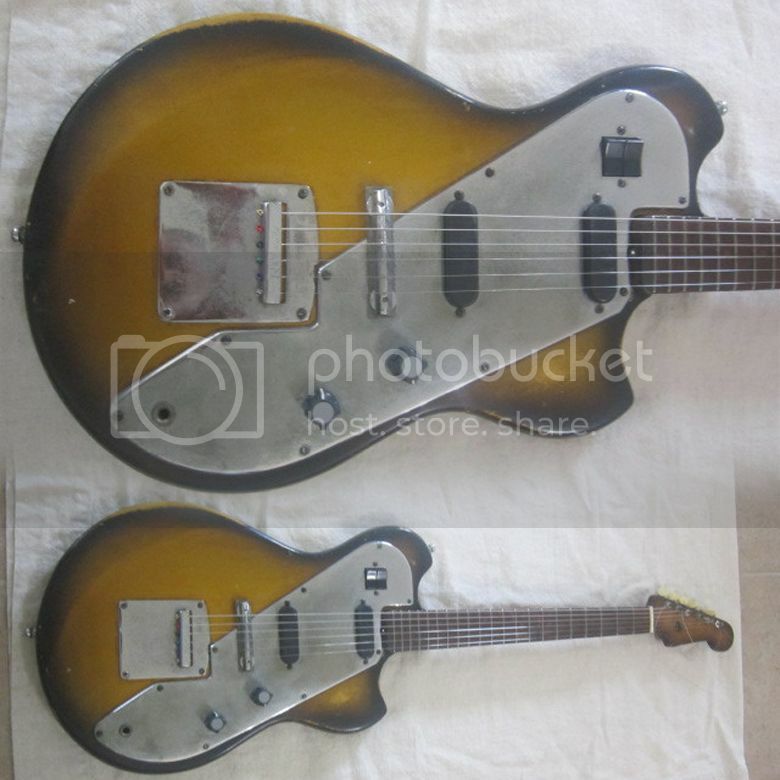 It's as if Teisco has become shorthand for obscure 1960s Japanese "junk shop" guitars. As to this "Nivico" guitar, I don't think it IS a Teisco, despite the push button pickup selector switches and the large expanse of metal on the face of the body. However, I'm happy to be proven wrong if you have any information on this instrument and have seen, played or even own(ed) one like it. The plate beneath the tailpiece is an oddity - it looks as if there should have been a vibrato arm here, but there are no holes in the plate so I'm guessing that this is a non-original later replacement. This guitar is currently listed on eBay with a starting bid of $260. 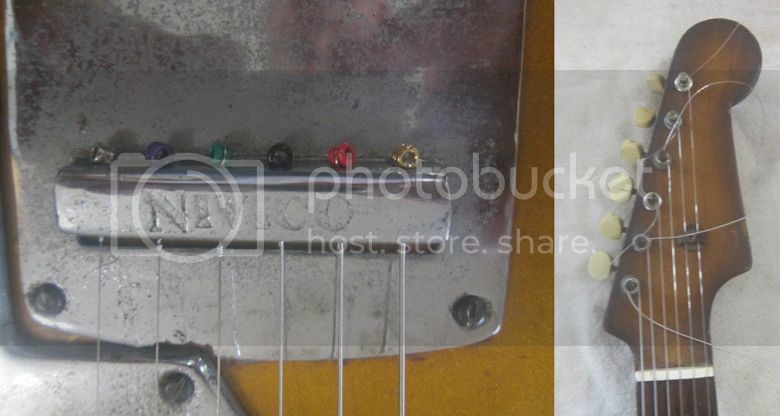 Labels: Japanese guitar, Nivico, vintage guitars, What's that guitar? Nivico is Nippon Victor or JVC of course. This is a fabulous steampunk axe. NIppon VIctor COmpany = NIVICO, now JVC. I think that is a relatively old guitar, mid 50's? Slotted screw heads! It might even be very early post war. Probably not the original knobs. Gotta be a replacement tailpiece plate; the cutout on the "pickguard" is square whereas the smaller plate has a rounded top. Not matching up to the point of having an overlap! Funky. I think this would look really cool with a more exciting finish than that drab sunburst.